Swedish cross country skier Gunde Svan arrived in Calgary as one of the greatest winter athletes of his era. He had made a glittering Olympic debut four years earlier in Sarajevo, when he returned home with two golds, a silver and a bronze, which was enough to see him acclaimed the world's finest cross country exponent of his generation. Expecting him to be as dominant in Calgary seemed a big ask, and in his opening two events, the 15km and 30km he finished a lowly 13th and 10th respectively. 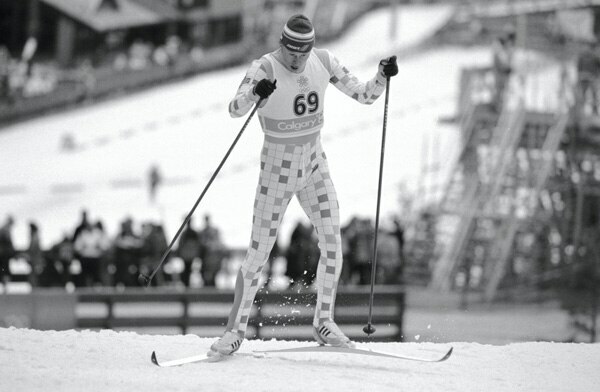 However, in the 50km, which had produced his silver in Sarajevo, he rediscovered his Olympic mojo. He faced a very strong rival in the guise of reigning world champion Maurilio De Zolt of Italy. The early pace had been set by Switzerland's Andi Grünenfelder. De Zolt and Svan were among the last competitors to race. The Italian struggled to match the early split times, but eventually made up the deficit with Grünenfelder's speed with about 10km left. Then Svan took centre stage. After 15km, he was 40 seconds clear of the field and a full minute ahead of De Zolt. He didn’t let up and the gap kept growing. Through the third time-check, Svan was nearly a minute and a half clear, giving him the luxury of being able to ease off in the final 10km. He still won by a margin of 1 minute 5.5 seconds over De Zolt, with Grünenfelder taking bronze. Svan added another gold medal as a member of the Swedish team that won the 4x10km relay, but despite the fact that he was just 26, this was destined to be his final appearance on the Olympic stage. Having also amassed six world championship titles, he turned his back on skiing to become a rally driver, and later turned his hand to acting and eventually became a TV game show host.